It can't just be me that feels like it's too early to be Easter already, I mean wasn't it just Christmas? I thought I'd pop up a quick review of a Yankee staple whilst you can still pick it up. It won't be long before it hops into hibernation for another year. 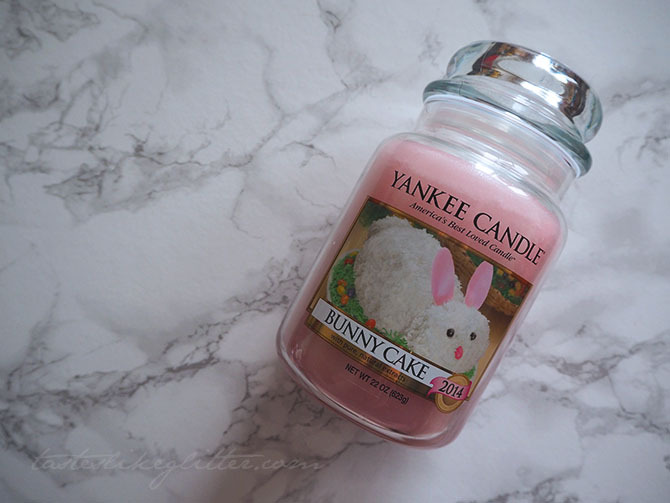 Bunny Cake is one of those fragrances that makes an appearance every Easter because it's so delightfully sweet, without the extra calories. So you can save those for a chocolate egg or two. The first thing you smell is the bright citrus mixed with the creamy vanilla. Making for a light, sweet fragrance. Topped off with a sprinkling of sugary coconut. What I love about this is that whilst it has a strong throw, the scent itself isn't to heavy and sweet. I find it more refreshing than anything else though of course it does lean towards the sweeter side of things. Definitely one to pick up if you're a collector, or perhaps looking for a gift that isn't edible.